On January 13, 2016, the 2015 Nutrena Tournament has concluded its championship games at the Pohnpei State Softball field located in Kolonia Town. The games started at 5:30 and ended at 8:30 in the evening. The Nutrena Tournament has become part of Pohnpei Sport Calendar of Activities and always sponsored by the supplier of Nutrena feeds for Pohnpei. The Co-Sponsors of the tournament are Seven Stars Store and Pohnpei Sports Office. The championship rivalry was held between the top two teams selected from the round robin, between Team Net and Team LP Gas. Both Games of the night ended with a ten difference regulation (10 points difference) causing the lights at the field to shut off early. Even with the early lights out, spectators and everyone enjoyed watching the games under the excellent weather of the night. This week Pohnpei Tennis Club hosted a successful qualifying tournament where junior tennis players from Pohnpei and Kosrae battled it out on the court to see who will fly the FSM flag in the North Pacific Regional Championship to be held in Saipan in June 2016. Jeremiah 6-0, 6-0, Israel 6-0, 6-0, and Kigo 6-1, 6-1. Deavyn placed at number 3 and Kigo placed at number 4 after making a few upsets being the number 8 in the tournament. In the 14 and under girls, Anne Skilling of Kosrae stunned number 1 seeded Isabel of Pohnpei creating the biggest upset of the tournament. Isabel went down to Anne losing the first set 6-2, she pushed herself to grab the second set but Anne proved too strong and quick taking the final set in a super tiebreaker 10-4. In the 16 and under boys category, Joab Williams of Kosrae took out 1st place while his fellow teammate Sterkis Abraham settle for runner up. Andrea Perillo of Pohnpei took out 3rd beating Weston of Kosrae. The 16 and under girls had only 2 competitors, sunshine Palik from Pohnpei and Chriselda of Kosrae. Sunshine went on to take the win 6-0, 6-2. Will Stinnett, son of Bill & Kiki Stinnett signed a contract to play professional basketball with the Hawks Bay team in Napier, New Zealand, on his 30th birthday. He says it was a great birthday present and a dream come true. His dream of playing pro ball started while attending Father Duenas High School where he played 4 years of varsity basketball helping the Friars win two Island Championships and along the way earned CO-MVP of the Championship Game his sophomore year, All Island 1st Team his junior year, and All Island MVP his senior year. While still in high school he also played basketball with the Island Dragons in an outside league and with the Guam Jr. National Team. He attended basketball camps at Duke University in Durham, the University of North Carolina in Chapel Hill, and a 5 Star basketball camp in Pennsylvania. By 18 years of age he was a member of the Guam National Men’s Basketball Team and graduated from Adamson University in the Philippines on a basketball scholarship. Willie’s first big basketball tournament was at age 15 when he played for Chuuk State in the Micronesian Games in Pohnpei. Since then he has played in basketball tournaments in Palau, Saipan, the Philippines, Samoa, Japan, Korea, Hong Kong, China, Australia and New Zealand, and most recently in Papua New Guinea at the XV South Pacific Games where, as Team Captain and playing point guard, Team Guam won the SPG Gold Medal. It was at the 2015 South Pacific Games that he attracted the attention of a number of Pro Basketball Teams from New Zealand who contacted him and the Team Guam coach, E.J. Calvo, about the possibility of playing pro ball in New Zealand. That led to Willie and 3 of his Team Guam teammates entering a FIBA 3 on 3 tournament in Australia where they earned the Bronze medal behind Australia and New Zealand. After that tournament they travelled to a number of cities in New Zealand and worked out with various teams and eventually Willie and teammate Joe Blas were offered contracts to play with the Hawks Bay team in Napier, New Zealand. Willie has been recognized by the Guam Legislature for his community service work with youth and the Chuukese community in Guam – most notably organizing the Matson sponsored Chuukese Basketball League consisting of 12 teams that took place in Yigo. He worked for the Guam Court as the Chuukese Interpreter and Alternate Sentencing Officer for the past 2 ½ years and just recently resigned to take advantage of this pro basketball opportunity. He has to be in New Zealand before the end of January and his most immediate goal is to help his new team reach the Championship playoffs this year and along the way attract attention of an Australian Team that could put him in a more competitive pro basketball environment and from there . . . who knows. His longer term goal is to return to Chuuk and help the family operate their full service hotel and dive center and at the same time, work with youth, the local community, help organize sports programs and promote facilities development to enhance athletic activities in the State. 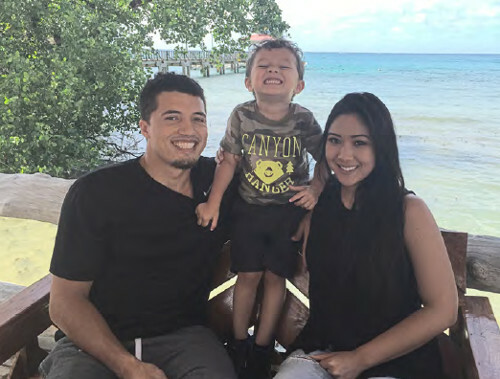 In preparation for his new life, he’s spending time in Chuuk with his young family and then travels to San Diego to visit family and friends there and expects to return to Guam around the second week in January 2016, then pack up for the big move south.